Born to Grill Tools Safety You've Grilled It, Now Serve It Four-Season Grilling Enjoy! My family keeps serving food from the grill simple. We use mustard from a squeeze bottle, hamburger and hot dog buns from a grocery shelf, and a major brand of ketchup. Our fries are frozen french fries, oven-heated so that they're crisp by the time the meat is done. My wife claims that I like a few fries with my ketchup. I'll admit that I can go overboard on ketchup, or mustard, but I'm learning to enjoy crisp, warm fries. A key to getting the most out of grilled food is not to overwhelm the flavor with mustard, ketchup, salt, or sauces. This is the basic outdoor grill food. My family likes whole wheat buns, but hamburger patties can go between slices of bread, bagels, or just about any bread product or pastry about the right size and shape. The ultimate simple hamburger is a hamburger patty between the halves of a bun. Unless you have an extremely juicy burger, this would be awfully dry. We squeeze a circle of mustard on the face of the top and bottom halves of a whole wheat bun. Leaf lettuce goes on the bottom bun until there's what my wife calls "a comfortable amount." For us, that's the point when the hamburger patty will almost, but not quite, fall off: a little over a quarter inch. 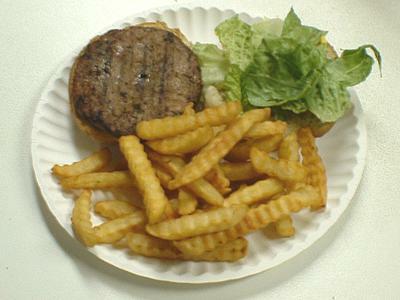 The burger goes open-faced on a plate, next to fries. This is the same as our usual weekend lunch, with a pad of alfalfa sprouts on top of the burger patty. We put about as much alfalfa over the patty as there is lettuce under it. Hot dog bun, grilled hot dog with a line of mustard, fries: that's all it takes. This is a major meal: one or two pieces of grilled chicken, unwrapped but still hot, potato still foil-wrapped from the grill, and vegetable. These stay hot for a half-hour or more, especially if they're kept in the foil they're grilled in. That's a good thing, since our grill is too small to grill potatoes and meat at the same time. At least, for a family our size. I grill potatoes first. Then they stay wrapped and sometimes under a towel. Butter or sour cream, in moderation, top them off. A slice of steak, a grill-baked potato still wrapped in foil, and vegetables: one meal with minimum fuss and good taste.